The South Korean military has discovered what may be Korean War remains during a demining operation at a front-line region, the Ministry of National Defense said Thursday, as the two Koreas withdrew firearms and guard posts from the jointly controlled zone inside the border area. The ministry said its war remains recovery agency found two sets of remains earlier this week at Arrowhead Ridge, located inside the heavily-fortified Demilitarized Zone. 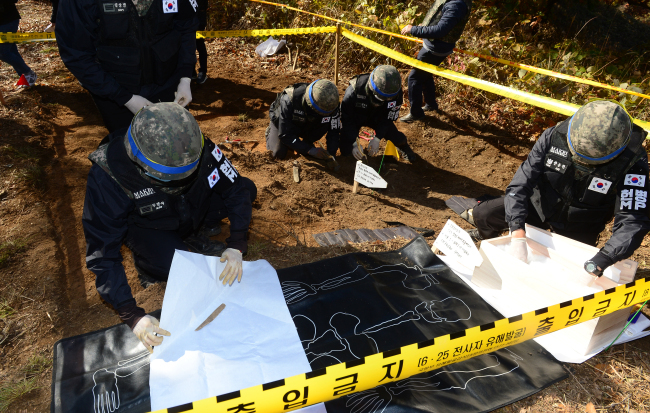 Rifles, helmets, bullets and a South Korean Army identification tag with the name “Pak Je-kwon” were also found along with the bone fragments. The military has suggested that Pak was a 20-something sergeant first class who died in the final months of the 1950-53 Korean War, when the allied South Korean-US forces clashed with the coalition of the North Korean and Chinese armies over the control of the mountainous stronghold. The military found the remains while removing land mines buried at Arrowhead Ridge during the Korean War. The demining operation was one of the military confidence-building measure agreed to by the two Koreas’ defense chiefs after an inter-Korean summit in Pyongyang last month. Agency for KIA Recovery and Identification said 19 land mines have been removed from the southern side of Arrowhead Ridge since the South Korean military launched its demining operation on Oct. 1. Following completion of the demining work by the end of this year, the agency will conduct a joint excavation of war remains at Arrowhead Ridge with North Korea next year. The operation will kick off on April 1 and continue until Oct. 30. The discovery of war remains came as the two Koreas militaries stepped closer to demilitarizing the Joint Security Area as the result of another inter-Korean military agreement designed to prevent accidental cross-border clashes. The Defense Ministry said Thursday that the removal of firearms and guard posts from the JSA had been completed as of 1 p.m. Along with the US-led United Nations Command, the two Koreas will conduct verification of the withdrawal over the following two days. The Defense Ministry expects the measure to soon allow for 70 security guards from the two Koreas and outside visitors to travel across the border inside the JSA, which has been strictly forbidden since the horrendous ax murders of two US soldiers by North Korea in 1976.